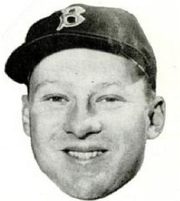 Jack Eugene Jensen (March 9, 1927 – July 14, 1982) was an American right fielder in Major League Baseball who played for three American League teams from 1950 to 1961, most notably the Boston Red Sox. He was named the AL's Most Valuable Player in 1958 after hitting 35 home runs and leading the league with 122 runs batted in; he also led the league in RBIs two other years, and in triples and stolen bases once each. Respected for his throwing arm, he won a Gold Glove Award and led the AL in assists and double plays twice each. He retired in his early thirties as major-league baseball expanded westward, due to an intense fear of flying. After being a two-sport star in college, Jensen was the first man to play in the Rose Bowl, the World Series, and the baseball All-Star Game. Jensen with the Red Sox. Jensen was born in San Francisco, California. His parents divorced when he was five, and he was raised by his mother, who frequently moved the family. After serving in the Navy toward the end of World War II, he became an All-American in two sports at the University of California. As a baseball pitcher and outfielder, he helped California to win the inaugural College World Series in 1947. He pitched Cal to victory in the regional final by outdueling Bobby Layne of Texas, and in the championship Cal defeated a Yale team featuring future President George Bush. As a football halfback, Jensen was a consensus All-American as a junior in 1948, becoming the first Cal player to rush for 1,000 yards. In the season-ending 7–6 victory over Stanford he ran for 170 yards, kicked a punt for 67 yards, and had a 32-yard run late in the game in a 4th-and-31 situation. Cal ended the regular season at 10–0 under coach Pappy Waldorf, winning a share of its first Pacific Coast Conference title in ten years, and Jensen placed fourth in the Heisman Trophy voting, with Doak Walker taking the award. In the 1949 Rose Bowl, Jensen scored a touchdown in the first quarter to tie the game 7–7, but 4th-ranked Cal was upset 20–14 by 7th-ranked Northwestern. In 1949, Jensen, who batted and threw right-handed, left college after his junior year and signed with the Oakland Oaks in the Pacific Coast League. His contract – along with Billy Martin's – was sold to the New York Yankees in 1950 with the intention of him being a backup for Joe DiMaggio. But he played in only 108 games for the Yankees over three years, primarily in left field. He appeared as a pinch runner for Bobby Brown in the eighth inning of Game 3 of the 1950 World Series against the Philadelphia Phillies, but was in the game only briefly before Johnny Mize popped up to end the inning. Jensen did not stay in the game defensively, and the Yankees completed a sweep of the Phillies in Game 4; he did not appear in the 1951 Series against the New York Giants. Following the arrival of Mickey Mantle with the Yankees, in May 1952 Jensen was sent to the Washington Senators in a six-player deal, and he made his first All-Star team. He finished the season with a .286 batting average and 80 RBIs, leading the league with 17 assists and placing third in the AL with 18 steals, a total he duplicated in 1953. He was traded to the Red Sox in December 1953, and led the AL with 22 steals in 1954, also finishing third in RBIs (117) and fourth in home runs (25). But despite his speed he also set a major league record by grounding into double plays 32 times, breaking Bobby Doerr's 1949 total of 31; the record would stand until Jim Rice grounded into 36 double plays in 1984. No longer facing the pressure of becoming his team's principal star, Jensen again made the All-Star team in 1955, leading the league with 116 RBIs and finishing tenth in the MVP vote. In 1956 he batted a career-high .315 and led the AL with 11 triples, and in 1957 he had 103 RBIs and led the league in both assists (16) and double plays (4). Jensen made his last All-Star team in 1958 when he batted .286 with a league-leading 122 RBIs, also placing second in the AL with 99 walks and fifth in HRs (35), doubles (31), total bases (293) and on-base percentage (.396). In June of that same year, he set a Red Sox club record for most home runs in a single month (since tied by David Ortiz) with 14. He won MVP honors, beating out Bob Turley, Rocky Colavito and Bob Cerv for the award. In 1959 he again led the league in RBIs (112) and won his only Gold Glove after leading the AL in double plays (4) for the second time; he also scored a career-best 101 runs and stole 20 bases, and came in tenth in the MVP balloting. Jensen announced his retirement from baseball in January 1960, primarily because of an intense fear of flying but also the result of the long separations from his family. He stated, "I have only one life to live, and I'll be happier when I can spend it with my family. Being away from home with a baseball team for seven months a year doesn't represent the kind of life I want or the kind of life my wife and children want." Indeed, upon his trade to the Red Sox in 1953 he considered not reporting to the team in order to return to his family in California, but general manager Joe Cronin increased his salary by $1,000 and he agreed to play. As teams had increasingly turned to air travel in the 1950s, he had unsuccessfully sought to combat his aversion to flying, aided considerably by Red Sox owner Tom Yawkey, who arranged for therapy treatments. Once major-league baseball expanded to the West Coast in 1958, and with further expansion and constant air travel foreseen, these difficulties became virtually insurmountable. Jensen returned to play in 1961, but turned to hypnotherapy when his panic attacks at airports became unbearable. Frustrated by a sub-par season (.263, 66 RBIs), he retired again for good. In an 11-season career, Jensen was a .279 hitter with 199 home runs and 929 RBIs in 1438 games. He also collected 810 runs, 1463 hits, 259 doubles, 45 triples, 143 stolen bases, and 750 walks for a .369 on-base percentage. Following his retirement, Jensen became sports director at a Reno, Nevada radio station, worked as a college football broadcaster for ABC television, coached baseball at the University of Nevada and at California, and also managed in the minor leagues. Co-owner of the Bow & Bell restaurant with Charles "Boots" Erb in Jack London Square. In 1949, he married his high school girlfriend Zoe Ann Olsen, the silver medalist in diving at the 1948 Summer Olympics; the couple divorced in 1968. Later that year he married Katherine Cortezi. He had three children by his first wife: Jon, Jan, and Jay. Jay's son Tucker Jensen pitched in two College World Series for Embry–Riddle Aeronautical University and played in the Toronto Blue Jays organization in 2011 and 2012. As of 2013, he was pitching for the Gateway Grizzlies of the independent Frontier League. Jensen died at or on the way to University of Virginia Hospital in Charlottesville, Virginia, at the age of fifty-five after suffering an apparent heart attack at his home near Scottsville,. Virginia. He is interred in Amherst, Virginia. He was inducted into the Bay Area Sports Hall of Fame in 1983, the College Football Hall of Fame in 1984, and the Boston Red Sox Hall of Fame in 2000. In 2000, the biography The Golden Boy: A Biography of Jackie Jensen was published by Peter Randall Press. The author was George I. Martin, with a foreword by Curt Gowdy. On April 17, 1956, Jensen appeared as himself, with Vivi Janiss as his mother, in "The Jackie Jensen Story", which aired on the NBC anthology television series, Cavalcade of America Child actor Gary Gray played Jensen as a sixteen year old. ↑ In 1959, Chuck Essegian became the only other person to play in both the Rose Bowl and World Series. ↑ "The Jackie Jensen Story on Cavalcade of America". Internet Movie Data Base. April 17, 1956. Retrieved August 8, 2016. ESPN College Football Encyclopedia (2005). New York: ESPN Books. ISBN 1-4013-3703-1.